Essex is a county of many countries, and the authors set out on foot to celebrate its people, history, architecture and geography by walking every inch of its boundaries. Whether tramping up the Maplin Sands, stumbling across an old soldier living wild in the woods, or visiting a chapel on a lonely seawall, their story is brimming with unexpected encounters and colourful surprises. Starting in Waltham Abbey, the authors' walk takes them down the old Essex border into London, along the Thames to the marshes, rivers and creeks of the eastern seaboard and then follows the Suffolk borders to the edges of Cambridge and Hertfordshire. Back in Waltham Abbey, they complete their 500-mile circuit by walking the new, post-1964, Essex border through Epping Forest and M25 country to the Thames at Purfleet. Harris, armed with his faithful sketchpad, casts his beady eye everywhere they go; Mooney, notebook and tape recorder at hand, quickly develops a sense of humour. "Essex must be the most unjustly abused county in England. Its reputation is pure snobbery... Essex is a land of rolling hills, wild marshes and delightful villages, churches nd old houses....its borders embrace the most varied topography imaginable. 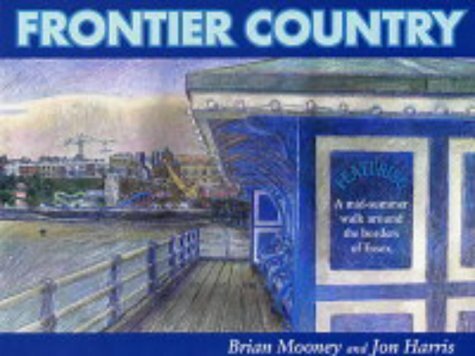 This is the Essex that Frontier Country explores; the authors' unusual journey reveals just how much there is to treasure in Essex." --Simon Jenkins "Columnist and Former Editor of The Times "
Brian Mooney is an author and prize winning journalist, who travelled the world for 30 years reporting for Reuters from 50 different countries. After climbing on Everest and walking 1,500 miles to Santiago de Compostela, he decided it was time to explore closer to his Essex home. Jon Harris is a leading authority on landscape, townscape and conservation, and a well known Cambridge artist. The Fitzwilliam Museum held a retrospective exhibition of his work in 1997. Jon writes regularly on East Anglia, and illustrates his articles with his own distinctive sketches and maps.